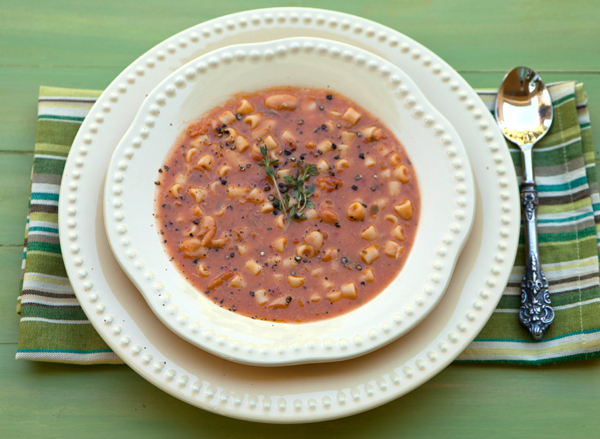 A traditional peasant recipe that is a great, stick to your ribs dish, Pasta e fagioli or pasta fagioli, simply means “pasta and beans”, referring to the two main ingredients in the dish. This traditional Italian favorite started as a peasant dish due to being composed of very inexpensive ingredients and most often is one dish that would be prepared at home for family, and not guests. 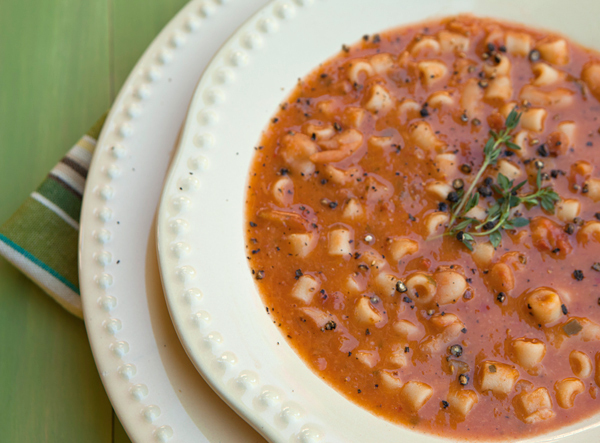 Today Pasta e Fagioli can be widely found even in restaurants, although it may be pronounced pasta fazool in the United States. Pasta fagioli is commonly made using cannellini beans or borlotti beans and some type of small pasta such as elbow macaroni or ditalini. The base is generally olive oil, garlic, minced onion, and spices, along with stewed tomato or tomato paste, and some broth or water, although some variations do not include tomatoes at all, and are made from only broth. By using a whole grain pasta, this dish can be a healthy, hearty meal in a bowl that the whole family will enjoy. If you are interested in making this dish vegetarian, simply use vegetable broth in place of chicken broth. Cannellini beans rock as they are packed with fiber, protein, folate & hard-working phytonutrients. Whole grain pasta is a good source of fiber and other important nutrients, such as selenium, potassium and magnesium. A hearty traditional Italian soup. Heat the oil in a large heavy pot, then cook the onion, carrot, and celery until soft. Pour in the broth, beans and chopped tomatoes, and cook for 15 minutes. Remove a few scoops of the bean mixture and puree or mash, then return to the pot. Add the pasta, chopped parsley and seasonings. Cook until the pasta is cooked al dente. Serve in bowls topped with a drizzle of olive oil, the shaved cheese and a sprinkling of chopped parsley.